Shirley and I celebrated our 50th wedding anniversary in August of this year in a relatively traditional way. We escaped to a seaside resort to reflect on how we ever managed to survive together for so long and at the same time count all the blessings that we have enjoyed during that tenure. Needless to say, we have been very fortunate from every angle. We are thankful for our health, the success of our children, and our retirement from the daily grind of work. We are a far cry from financial wealth, but we are surviving and learning to live within a fixed retirement budget. Our greatest recent shock (pleasant, though) was when our beloved children presented us with their anniversary gift to us…a trip to Hawaii. We expected some sort of celebratory gift, of course, but nothing on the order of such a wonderful experience. We have been to Hawaii four times, and interestingly enough, our kids gave us our first trip Christmas, 1997. We made that trip in the summer of 1998, and it must have appealed to us, because we went back in 1999, 2000, and 2002. We have visited five islands, been a condo owner, experienced Hawaiian “aloha,” and would probably be living in the islands except for some minor details like proximity to jobs, family, church, friends, and (in our case) access to top level medical care. Those details are powerful influences, however, so by 2011, Hawaii had become a pleasant and everlasting memory and a return thereto a bit of an unreachable objective. As we had approached retirement, ideas of financial stability began to dance through our heads, especially after experiencing medical challenges in 2008-2009. It’s amazing how chemotherapy can change your priorities. So anyway, with a new trip to paradise scheduled for December, 2011, our excitement began to rise as the time approached. Sunday, December 11. Our day began at 6:15 a.m. with a sounding alarm, and in a few minutes we were on the road to Houston Intercontinental with our daughter playing the part of chauffeur. A quick goodbye at the departure station, a check in of luggage ($50.00), and a pleasant trip through security (! ), and we were ready to board our aircraft. Of course, having arrived early, we had nearly an hour to kill, so we had a bagel and coffee, and fiddled with our phones. 8:15 takeoff via U.S. Airways to Phoenix, Arizona. It is a testament to the dedication and commitment of travelers that we allow ourselves to be crammed like sardines into aluminum cylinders just so we can get somewhere quickly. Every element of civility and comfort in travel is removed on an aircraft for the sake of sheer numbers of victims…and we, the victims, never think twice about signing up for another bout with torture the next time we decide to travel. Can you tell I do not like to fly? Compacted and crumpled, we arrived in Phoenix to a layover of a couple of hours before our long jaunt to the islands. At least we were able to stretch our legs for a few minutes. The call came quickly enough, but not before we were warned that “unfortunately” the aircraft only had meals for twenty five people on board, and, as a result and since it was nearly seven hours to Hawaii, it might be wise for us to get something to eat before we entered the aircraft. Incredible. So we boarded with a sack containing two cold sandwiches ($24.00 in the terminal) for our trek to our destination. It was the first flight I’ve ever taken where all the stewards (no stewardesses) were gray haired old dudes. They looked like retired pilots. Sardines in a can have an advantage over airline passengers…sardines have no feelings. Believe me, in seven hours, anything that can ache on your body will ache, and squirming will only take care of a small portion of the discomfort. With seats that in any other venue would be classified as children’s seating, and with neighbors uncomfortably within their zone of ease, the unfortunate passengers have nowhere to go. Attempts to sleep through the ordeal are for the most part fruitless. I really think that if I had a chance to rewrite the scriptures, I would make it permissible to drink something really, um…strong while traveling on an aircraft just so the weary pilgrim could make it to the prescribed destination in a reasonably sane condition. Either that, or save up and go first class and hobnob with the social elite. However, first class or baggage, it makes no difference as far as the smoothness of the flight is concerned, and this was not a smooth flight. Patches of heavy, high clouds made for lots of wind currents which made for a lot of bumps in the road. As we neared Honolulu, it became worse, and as we made our landing approach a lady near us began to loudly vomit. She gagged until we were on the ground and made our captain’s “Welcome to Hawaii!” a little difficult. 3:30 Hawaii time (7:30 Houston) we walked into the terminal, and instantly our spirits began to lift. There’s an excitement in the air of Hawaii not present anywhere else, not to mention the aroma of plumeria. The airport, though busy, is a much more manageable size than the mega-ports on the mainland, so we were able to track down our baggage and head for the exits without too much anxiety or walking. Fortunately, not too long after we went outside, a Hilton shuttle van came by and we boarded to head to our hotel du jour, the Hilton Waikiki Beach. We found out quickly that the traffic in Honolulu hasn’t changed much…it’s still as bad as Houston. The H1 Interstate (it’s called an interstate even though there are no other states to go to) was bumper to bumper and, once we ducked off the H1 and entered the Waikiki district, the roads quickly narrowed and slowed even more. But it was all good…after all…we WERE in Hawaii and getting closer to our destination by the minute. The Hilton Waikiki Beach, formerly the Hilton Prince Kuhio, is a very nice hotel about two blocks off the famous Waikiki Beach, and to a certain degree reflects what you would expect in a Hilton hotel. Since everything had been prepaid by our darling offspring, check in was quick and painless and we were whisked up to our room on the 29th floor. Our room was a “mountain view” room, an up grade from a “city view” room but not quite an “ocean view” room. Which was just as well…an ocean view room meant having a window to look through a crack between two other hotels between the Hilton and the beach. We had a “lanai,” an outside deck which gave us a panoramic view of the city, the Ali Wai Canal and the mountains to the north. It was a beautiful view. The furnishings were very contemporary with a big LCD TV and a very stylish bath area. Quite nice. By the time all this went down, it was nearing 6:00 p.m. Of course, in our bodies, it was 10:00 p.m. Houston time, and we were tired, but not too tired to go out and look over the downtown Waikiki area. The Waikiki district of Honolulu is a very compact, densely populated area. Fully 75 percent of the people you see on the streets this week will not be in Honolulu next week…a whole new crew of vacationers will have arrived. It is a forest of tall hotels, some on lots as narrow as 50 feet wide and yet 30-40 stories tall. The streets are narrow, too, and traffic is heavy. Having never been to New York City, the only comparison I can draw is based on what I have heard, but like New York, Honolulu (at least the Waikiki district) never sleeps. We walked down Kuhio Avenue and Kalakaua Boulevard and everywhere it was a beehive of activity. Street minstrels with accordions, drums, violas(! ), violins, guitars, singers with varying degrees of singing skill, magicians, bird lovers with parrots and parakeets, Hawaiian (presumably) natives weaving, carving, and painting….and all of them wanting you to part with some of your money. We walked through the Waikiki Town Center, a mishmash of hawkers pushing cheap tee shirts and gold colored trinkets, and through the International Marketplace, which is like the Waikiki Town Center, but with more class. With this being our fifth trip to the islands, we have survived the souvenir collection era, and so we were probably a big disappointment to the hawkers as we walked and resisted their pitches. There were two glaring differences in our forays through the Waikiki district compared to our earlier trips which probably reflect our national economy. On our earlier trips there were hawkers selling quality gold and silver items at really good prices, and a walker could not traverse a single city block without being offered a free dinner or prize if one agreed to listen to a sales pitch on a timeshare condo. We’ve been down that road, too…having purchased a condo on our first trip to the islands. I have in the past purchased gold items in the Waikiki district that I was able to subsequently sell at a profit back home, but this time, I saw not a single piece of real gold or silver in the marketplaces…nothing but cheap gold plated trinkets. We went to the area where many of the time share businesses were ten years ago, and the place was deserted with the exception of various food carts and tee shirt displays. I think times may be tough in the timeshare business. By this time, we really were dragging, but we were also hungry, so we went to the Hilton restaurant where we were reminded of the price of food in Hawaii. Two sandwiches and drinks cost $38.00, but we were too hungry to complain (much.) By 10:00 Hawaii time (2:00 a.m. Houston time) we were lights out. Our first night in Paradise. Monday, December 12 Looking out over our lanai to the mountains of the north the next morning, we could see the heavy rain clouds which practically every day hang low to bring moisture to the highlands until mid morning when the trade winds move them away. By 9:30 the sun had brightened the day and to the west a beautiful rainbow swept over the city. We had breakfast in the hotel dining room while we waited to meet the first Pentecostals we have ever met in the islands. Before we had left home, our good friend and church brother, Trini Hernandez, mentioned to us he knew the pastor of the church in Waikiki, and he asked if I would hand carry a note to him and his wife. I agreed, of course, and upon arrival last night, Pastor Jonathan Sanders called me and set up a meeting time of 10:00 a.m. Monday. We sat in the hotel lobby, and, sure enough, about the appointed time, in walked Pastor Sanders and his wife. I had never seen them before, but I knew who they were when they walked in the door. There’s something about Pentecostal ministers (and wives) that makes them stand out in the crowd…and I mean that in a complimentary way. In the true spirit of Hawaii, they presented us with leis of aromatic flowers, and greeted us as brothers and sisters of like faith. The Sanderses are probably in their late thirties, and have been in the islands twelve years, which amazed me because we had never heard of them and as far as we knew there was no church in Honolulu. We have been by the church on Maui but have never attended, primarily because it has never had a mid-week service, and we are usually arriving or leaving on Sundays. We visited with Pastor and Sister Sanders for an hour or so, dutifully delivering the envelope. We appreciated their sincerity and dedication…they have two churches, one in Waikiki and one on the east side of the island in the Kaeneoe area, so they stay busy. Not to mention that they have children in school, also. We took a photo of them to prove to Brother Trini when we get back that we actually visited with the Sanderses and didn’t blow the money I suspect was in the envelope on wild partying. As we were parting, Shirley had trouble moving because her back has been bothering her, so Brother Sanders suggested we pray. Right there in the hotel lobby amidst scurrying travelers, four Pentecostals prayed for healing for Shirley, and, you know what?…for the rest of the day we walked, shopped, toured, climbed bus stairs, and walked some more…and Shirley felt no discomfort or pain. I choose to think that God will take care of our little problems as well as the big ones. Well, anyway, since we had no car, we were trying to figure out some way to see as much as we could the easiest way possible. About that time I heard the ding of a Hilo Hattie trolley car, and it suddenly flashed in my mind that the trolleys were free for Hilo Hattie customers, and they went everywhere in the Waikiki and Ala Moana districts. So we hopped on a open air trolley car and headed to Hilo Hattie’s, the shopping destination for tourists insisting on paying the highest possible prices for authentic Hawaiian products. En route, we drove by our former homes in the Waikiki area, the Kuhio Banyan Vacation Resort and the hotels Sheraton Princess Kai’ulani, Malia Sky Court, and Hawaiian Monarch. Each brought back memories of pleasant days gone by. We exited the Waikiki district via the Nimitz highway and passed the large Ala Moana shopping center to the right and the yacht basin to the left. We saw several of the cruise boats we had taken dinner cruises on during past trips to the islands…the sleek Navitek, a 70 foot catamaran and the clunky Ali Kai. All in all, what we saw of Honolulu had not changed very much…which is good. Especially Hilo Hattie’s. As we entered the store the “world largest Hawaiian shirt” greeted us just as before, along with the free samples of various Hawaiian juices…always cold and fresh. Hilo Hattie’s is the Walmart of Hawaiian goodies…except it charges Macy prices. The first Hawaiian shirt I looked at was priced at $88.00. I know, I know…I’m still living in the 1970’s, but it seemed a trifle high priced. I will admit that all the products there were Hawaiian created and very high quality, however. And, contrary to the Waikiki district, they were selling gold and silver jewelry, but had we bought any, we would have had to check out of our hotel and go home. We could not have afforded to stay any longer. As I wandered around the area, an announcement was made that hula dancers would be performing in the middle of the store, so I made my way (for strictly education reasons) to that area. The first dancer performed a hula to The Little Drummer Boy, and, though it sounds a little strange, it was beautiful. The dancer was very business-like, however, and performed without a smile and somewhat mechanically. The second dancer, a young, dark-haired beauty, danced for me, however. Okay, I’m probably imagining a lot into this, but as she began to dance, she looked squarely at me and smiled broadly. Looking back, she probably thought, “I’m going to give this old guy something to remember!” Well, she did. Standing six feet away from me, she began to dance (for me), so I whipped out my camera, put it on video, and began to record. I don’t even know the song she danced to, I was so mesmerized. For two minutes, I forgot where I was. At the song’s conclusion, she smiled, bowed toward me, and vanished around the corner. The next dancer came forward to perform, but the spell had been broken, so I wandered away, happy that the magic moment had been saved on my camera to relive some other day. Shirley and I wandered around the store for a while longer and then reboarded the trolley for the ride back toward Waikiki. We decided to stop at the Ala Moana shopping center to wander around there a bit. As we rode toward our next stop, I reviewed the video of my hula dancer, and edited some of the other photos I had taken in the last 24 hours. The Ala Moana shopping center is Hawaii’s largest center and has, beyond stores, one of the most international food courts I have ever seen. Any food from any country is available, and the choices are mind boggling. Being wild, innovative, culinary experimenters, we had Mexican food. As we sat, munching on Hawaiian-made cheese tostados and refritos, I clicked on my camera to, well, you know, watch my hula dancer. I clicked to the video file…no file. I frantically panned through my photos…no video. 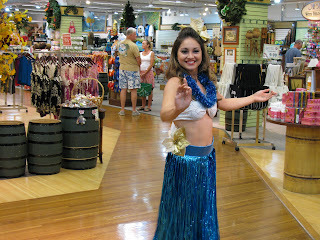 I then realized to my horror that in editing my photos while on the trolley, I had inadvertently deleted the hula video! It was at that very moment that I learned something else about God…He has a really strange sense of humor. For a second or two I was mortified, but then I came to the conclusion that it was probably just as well that the video was gone. Old guys should not be watching hula videos and letting minds run wild. So I told myself it was a great memory, and let my hula girl go. Aloha! We exited Ala Moana Mall and crossed the street to Ala Moana Park, a center of town oasis of rest which has a beach and some really huge banyan trees. The largest banyan tree in the world is on Maui in Lahaina, and that one single tree occupies a city block. Banyan trees have a peculiar growth pattern in that their limbs will grow downward into the ground and resurface somewhere else. You see a forest of seemingly many trees, but it’s actually one single tree gone wild. Other banyan trees look like mighty oak trees, but their trunks are abnormally large, with circumferences exceeding 50 feet. So we waited amidst the banyan trees and sleeping Hawaiians (siesta time, apparently) for the Hilo Hattie trolley to come by. We clanged out of Ala Moana on the trolley and reentered Waikiki, rumbling past the Royal Hawaiian Hotel (The Pink Palace) and the ritzy part of Kalakaua Avenue to Waikiki Beach, where we exited. We had already decided we did not have time to take a dip in the ocean at Waikiki, but a pilgrimage to the beach is required when one visits Hawaii. There are larger, sandier, warmer, fancier beaches in the world, but there is only one world famous Waikiki Beach where millionaires and homeless hang out side by side. It is trendy, hip, and gaudy…and totally cool. No doubt someone there saw us and was thinking, “Who are the two old fully clothed people there on the beach?” No matter. We didn’t stay long. Leaving the beach scene, we walked to the Outrigger Hotel wherein exists one of the favorite places for Shirley and me…Chuck’s Steak House. Overlooking Waikiki Beach while dining on prime rib is a culinary experience everyone should enjoy. It’s just the food, the scenery, the beach, and the total ambience of the situation that seems magical. As much as we wanted to enter and dine, we just were not very hungry, what with our Hawaiian Mexican food still talking to us. We did not want to spend a princely sum on two really fine steaks but be too stuffed to enjoy them, so sadly we took a rain check. I took a photo of the menu, however, to remind us in days to come what we missed. We made a quick trip back through the International Marketplace to make a couple of purchases, then started walking in a somewhat aimless direction toward the Hilton. We walked by the Sheraton Princess Kai’ulani, one of our former hangouts, which reminded us that somewhere nearby was a KFC and a Denny’s. Sure enough, the KFC was still there, so we had some southern fried (Hawaiian) chicken. A bucket of chicken to feed four was $46.00. (We didn’t get that.) When we were here before, there was also a wonderful outdoor breakfast establishment a couple of blocks away from the Sheraton we had enjoyed on several occasions. After walking for a few blocks we found it…except now it was an outdoor upscale steakhouse. We inquired about breakfast, but, alas, the all-you-can-eat breakfast for $5.95 is no more. Hardly a shock, I guess. After walking for another hour or so, visiting old haunts and refreshing our memories, it was time to seriously head for the Hilton. We had walked ourselves to exhaustion but enjoyed every minute of it. As luck would have it, we stumbled by Denny’s, and by that time I was ready for a cup of coffee, so in we went. I expected higher prices and wasn’t disappointed. The breakfast you pay $5.99 for in Houston costs $8.49 in Honolulu. But what shocked me was the restaurant had the very same additional $2, $4, $6, $8 dollar menu that we have in Houston. So I had a cup of coffee and the same $2.00 banana pancakes that I usually have at home. What a deal! Only then did we finally make the trek back to the hotel, totally worn out, but happy for the wonderful day. If only I had not deleted my video! Tuesday, December 13. After a quick breakfast in the hotel, we quickly checked out and went downstairs to the lobby to await our shuttle to the airport. About 10:00 a.m. we said goodbye to the Hilton Waikiki Beach and traveled through Waikiki en route to our next flight and adventure. We were flying Hawaiian Airlines to Maui, so check in was pretty easy except for the now-customary luggage charge. At least it was $18.00 per checked piece instead of $25.00. About 11:45 we broke the bonds of Earth and headed to the Garden Isle. Basically the plane takes off, they retract the wheels, fly for 15 minutes, and then start the approach to Kahalui Airport. Thirty-five minutes from takeoff to landing. The aircraft was sparking clean and smelled like a new car, and the stewardesses looked like Hawaiian stewardesses should look. I took some photos along the way. In fact, I have been taking photos like mad. Photography has come a long way since our trip here in 2002. Back then it was 35 mm film and now it’s 10.0+ megapixel digital. My photos from those days appear to be poor quality compared to today’s standards, so I’m trying to update my photo inventory with more a contemporary quality product. Didn’t take long to collect our baggage; Kahului is a far cry from Bush International. We had a Advantage Car Rental reserved, so we caught a shuttle to their offices just off the airport property. Within a short while, we were heading through the town of Kahului looking for highway 380 to take us to the western coast of Maui and our new home. We saw familiar sights along the way: the Maui Tropical Plantation, where we once saw a dainty Hawaiian lady rip open a cocoanut with her bare hands, and Ma’alaea Harbor, jumping off place for most of the whale watching boats and snorkeling excursions. It’s also home to Buzz’s Wharf Restaurant, one of our favorite places to visit for wonderful seafood. It’s a fact that most fish that are prepared in the restaurants of Hawaii were alive 24 hours before the time of serving.. The restaurants buy their seafood daily from their suppliers, and the freshness is palpable. Close to Ma’alaea highway 380 runs into highway 30, which takes us around the western coast to our destination. The western coast of Maui outside of Ma’alaea is barren…raw volcanic rock and very little vegetation….at least until one comes to the old whaling town of Lahaina, and there the sea breezes create more moisture and for the next 30 miles or so, there is lush grass and vegetation on the order of a rain forest. Hawaiian topography and flora and fauna offer rapid contrasts as one travels around the island. Barren rocky moonscapes can be within 15 miles of rain forests, and sandy beaches are a mere ten miles as the crow flies from the chilly 10,000 foot summit of Haleakala Crater. We drove through Lahaina, an 18th century whaling village which has become an eclectic blend of kama’ainas, Hawaiians, hippies, yippies, and yuppies tolerating foreigners, mainlanders, boomers and late bloomers. It’s claim to fame these days is Front Street, an old west styled narrow street with natives selling authentic Hawaiiana, hawkers selling imitation anything, and trendy, expensive shops with enough gold to attract The Donald.. There’s still some history around from the missionary days, but the natural beauty of the area and the surrounding luxury hotels have attracted the well-heeled traveler. The harbor is full of high dollar yachts from around the world, and the nearby private airport sports many private international aircraft. As we eased through the village, we spotted the Pentecostal church where we may be this coming Sunday morning. Driving further north along the Honoapi’ilani Highway (30) we came to our exit, turning downhill to the Lower Honoapi’ilani Road and eventually to our destination, the Kuleana Condominiums. Our unit was a privately owned unit in the complex which our beloved children had reserved for us for the week. The complex is a consortium of probably 90 units, and I got the drift that most are timeshare units, because there are salespeople on duty with hungry looks in their eyes. Apparently the owner of our unit is the only full time year round owner, and he owns two units. I would suspect they give him and his wife a reasonably good income, since they have apparently owned the properties since the late eighties. Regardless, this unit proves the old real estate adage that the three most valuable elements of any real estate are location, location, and location. It is an extremely nice unit, beautifully furnished, well maintained, contemporary and comfortable…but the location! Fifteen feet from the beach with an unobstructed view of the islands of Lanai and Molokai, by nightfall we had seen large turtles swimming about and whales breaching (jumping up out of the water, you know) in the channel off the beach. The whale came straight out of the water and fell over in a fountain of spray just like you see on National Geographic Presents. This is not my favorite descriptive word to use…but it was awesome. I was pleasantly surprised to discover that the water wasn’t cold; I was afraid that the December temperatures may affect the snorkeling somewhat, but I think it will be okay. By the time we got settled in, the sun was beginning to set, so no swimming today. Our first sunset on the veranda (excuse me, lanai) was spectacular as the sun drifted down behind the island of Lanai. To sleep with the sound of surf crashing in the distance. Wednesday, December 14 Awoke to an incredible morning. The surf had quieted a bit, and the only clouds in the western sky seaward were hovering over the summits of both Lanai and Molokai. The channel between the islands was a deep navy blue with smatterings of whitecaps. Occasionally there would be a visible wisp of what appeared to be smoke on the sea surface, but it would only be a whale exhaling a truckload of compressed air. Once, a giant black and white torpedo came shooting out of the sea surface and crashed downward, sending skyward a massive fountain of water. Scientists still do not understand why whales enjoy making such scenes, but they surmise that, since the whales are in Hawaii to interact and mate, it must have something to do with the courting procedure. And we do know how boys like to show off. Anyway, we had a leisurely breakfast…basic cereal, etc. We had stopped by the grocery store yesterday to pick up a few things for snacking, etc. One of the first things I noticed as we entered the local store was a 16 ounce package of pepper cheese like I like….priced at $13.88. I decided this would be a good week for a long fast. We bought basic, I mean really basic stuff, enough to fill one bag, and it came to $78.00 Oh, well. A certain singer sang, “You only live twice, or so it seems; once for yourself, and once for your dreams!” Maybe we’re just dreaming. After breakfast and a quick observation of beach conditions, we decided to take a drive up to Kapalua and look over our old stomping grounds around our former condo. The Gardens at West Maui is still there, but the place seemed deserted. Maybe everyone was somewhere else…it was clean, maintained, and all that, but there just weren’t any cars around. I noticed “Consolidated Resorts, Inc.” wasn’t on the sign anymore, so there may have been an ownership change. Regardless, we had some good times there. The Kapalua area is a high-fallutin’ part of West Maui, and it is still a beehive of activity. The first PGA tournament of each new year is played at the Kapalua Plantation course every January. We drove by Kapalua Beach, one of the premier snorkeling areas on Maui and past Honolua Bay, another premier snorkeling spot that is much more remote. No sand, just rocks and coral and lots of fish. In times past, the road basically ended a couple miles past Honolua Bay. There was a trail, but it was really not conducive to driving, especially in a rental car. I kept driving, looking for the end, but it never came, and the road seemed pretty good…narrow, but good. Because the northern crown of Maui has never had much in the way of roads, tourists in this area are somewhat scarce. It is one of the last bastions of the native Hawaiian, and it is here that modern conveniences are still just now making inroads. This northern part of Maui is like the northern part of O’ahu…spectacular cliffs, mountainous waves, remote beaches…the natives call it “the country.” I saw handwritten on two signs along the road…”Keep the country…country.” But it is a lost cause. 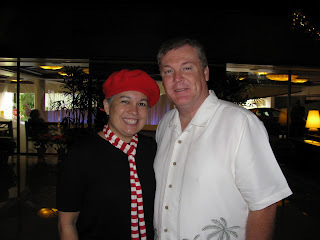 On our last visit to O’ahu nine years ago, we drove the road leading around to the western side of the island, which at that time was pure Hawaiian…no clubs, no resorts, no nothing. I noticed this time, the whole western side of O’ahu is one massive resort after another. No wonder the Hawaiian feels threatened. Continuing on our drive we reached Nakalele Point, the northernmost point on Maui. Here the waves crash into cliffs several hundred feet high, and it reminded me of another sign I saw…”Never turn you back on the ocean…it will slap you!” It was also at this point that the road took a dramatic turn for the worse. Now we were down to one lane, and we were driving the edge of the cliffs…sheer up on the right and sheer down on the left. Every hundred yards or so was a slight widening of the road to allow for autos to pass. As luck would have it, we met someone, and I pulled to the right as far as I could (Shirley rolled her window down and could touch the rocks) and I rolled my window down and folded my outside rear view mirror back. It didn’t seem like there was six feet between my car and the dropoff on the other side, but the other driver crept forward. I guided him to where he cleared my car by about two inches, and his tire tracks were on the very edge when he passed by. I was glad we were going in a clockwise direction around the island because it meant we would always have the cliff side of the road! The road became one adventure after another as we dodged fallen rock, drove through minor mud slides, and marveled at the jungle of vegetation that seemed undisturbed since time began, all the while keeping a wary eye on the dropoff on the other side of the road.. No Hilton hotels out here. We occasionally traversed a narrow one lane bridge, and always kept our eye out for the next pulloff so we could plan for the next auto encounter…but we saw few cars. We were in the REAL Hawaii, and I loved it. Eventually we reached the ancient village of Kahakuloa. 100% Hawaiian, I had read since arriving in the islands that the village was fiercely native and the locals didn’t take kindly to mainlanders invading their space. The one lane road crept by a small wood frame church and around a couple of simple homes, and suddenly there in the road was a big Hawaiian wearing a sarong, waving his hands and yelling. For an instant I was defensive, but then I saw he was smiling. He approached the car with bags of fruit, “Aloha! Howzabout some fresh pineapple!” he greeted. Well, just to be safe, I wasn’t going to say no, so we bought a bag. He asked us where we were from, and we said Houston, Texas. Then he said, “How about that T.J. Yates! Pretty good for a rookie!” Apparently the Texans have fans even in deepest, darkest Hawaii. He welcomed us to Hawaii and invited us back anytime, and we were off down the road. I wish I had gotten his photo. By this time we had crested the northern circle of Maui and were progressing southeast toward Kahului. Once we passed the village of Waihe’e the road began to improve, and eventually we were actually back on a real two lane road. Seeing Kahului in the distance, we knew we had survived the journey and were approaching civilization again…too bad. Eventually we intersected highway 30, the road to Lahaina, where we would eventually complete the circle around the northern half of Maui. As we approached Ma’alaea Harbor, we remembered our friend, Buzz’s Wharf Restaurant, and realized we hadn’t eaten in several hours. Time for a food refuel. As we pulled into Ma’alaea Harbor, I wondered out loud to Shirley if our old snorkeling boat, the Mahana Nai’a was still there. In 1999 and 2000 we had taken snorkeling trip aboard her to Molokini Island and Turtle Bay. Passing the docks, the catamaran was not visible, so we drove over to Buzz’s. Right next to the restaurant was a big ship, drydocked, with workers crawling over it, welders cutting holes, painters painting…and on the side of the boat were the words “Mahana Nai’a.” It looked a little worse for wear, but it was obviously getting a refurbishing, so it was good that the old gal was going to live another day. Entering Buzz’s, it was déjà vu.. Not much had changed, except the prices on the menu. I had a mahi mahi sandwich, and it was delicious. Back through Lahaina to the Ka’anapali area to Snorkel Bob’s, an institution in the islands. Renting anything nautical, Snorkel Bob’s also preaches conservation and encourages protecting the environment. I needed to see if he had optically corrected snorkeling goggles to rent, and sure enough, not only did they have them, but the sales person carefully fitted my prescription and gave me a vision test to make sure all was satisfactory. I was ready to hit the water! Finally, after a full day we arrived back at our condo, completing a long circular journey. Here in the lower latitudes sunset occurs quickly and by 5:30 darkness had settled it. We entered the condo just in time to see the sun hide itself in the west, and we were ready to hide ourselves also. We were tired. We caught up with our communications, saved all our photos taken during the day, and had our nightly cup of coffee. Lights out. Thursday, December 15 Another quiet condo breakfast, sitting out on the lanai watching…well...everything: the waves rolling in, the clouds drifting over distant Lanai and Molokai, the palm trees swaying in the morning breeze, etc. I could get used to this. I wanted to get a closer look at Kapalua Bay to see if it had changed very much, so to it we drove. It is next to the Napali Kai Beach Resort but is open to the public. Hawaii does not have open beach laws like in Texas, so the resorts can restrict access. Fortunately there are many great open beaches available. In previous visits we spent several afternoons at Kapalua Beach because it was just a short walk from the Gardens at West Maui, our former condo home. Walking down to the beach, I immediately noticed the luxury homes now standing a hundred yards or so uphill from the beach. They are across the Lower Honoapi’ilani Road from the beach, so they don’t really affect the ambience of the area, but they’re there nonetheless. Civilization encroachment to a natural setting. Anyway, the beach looked inviting, and it boasts great snorkeling, so we will probably be returning soon. Returning home, I was anxious to try out my new optical goggles, so I got ready to hit the water. Entering at the beach by our condo, I discovered that it’s a bit of a challenge to stay organized while being constantly pounded by foamy waves. Our condo’s beach is not protected (not in a cove or behind reefs), so the waves do rumble in. I managed to get underway however and again began to enjoy the serenity of snorkeling. I was hoping to see a couple of the turtles we have seen splashing around from our lanai, but none were in my area. Visibility was not great because of the pounding waves, so other than a few tropic fish of varying colors, I didn’t see much. Around the rocks to the left of our condo was a ladder leading directly from the water’s edge up over the rocks to the sidewalk. I decided to exit from the water there and found it much easier than fighting the surf waves on the sandy beach. Rather than repeat the above story two more times, let me say that the rest of the day was spent relaxing, eating, snorkeling, napping, reading, and writing. Other than the morning jaunt to Kapalua, we did not leave the condo. I know it probably sounds boring, but how can one be bored in paradise? Friday, December 16 Two days of having breakfast cereal is enough, so this morning we drove to the Aloha Mixed Plate Special Restaurant (doesn’t sound classy) and sat in an outside veranda overlooking the Lahaina Harbor. Eggs, home style potatoes, Portuguese sausage, toast, and coffee is a good way to start a day…mixed with the slightly salty sea breezes, bright sun, and Hawaiian music. I guess I should have ordered eggs and Spam (it was on the menu), what with Spam being the popular meat (?) it is in the islands. Hawaiians eat more Spam per capita than any other state in the United States, and it is traced back to World War II and military K-rations. Spam was introduced to the islands and became wildly popular. Maybe they were tired of fish, I don’t know. When we shopped in the grocery store earlier, there were more than a half dozen varieties of Spam…Spam with cheese, with black peppers, spicy, mild, even with Tabasco. And there was lots of it available. Anyway, we had a good breakfast. We decided to drive around exploring a bit, so, in preparation for our whale watching boat trip this afternoon, we located the Pacific Whale Foundation on Front Street, then located the UPC church. We had seen the church building from the highway, but weren’t sure how to get to it, so we prowled around until we found the right street and drove into the parking lot. The pastor here, Thomas Bailey, is a nephew of the Bowdens, our good friends from Bethel Tabernacle. The Bowdens had told us of him before we left, so we agreed to look him and his wife up. A simple sign standing near the highway announces “United Pentecostal Church,” and that’s it. No schedule of services or pastor’s name. We will call them tomorrow to find out the church schedule for the weekend. I took a couple of photos to show the Bowdens, and we moved on. Back to the condo for a brief respite. About 12:45 we left to head back to the Pacific Whale Foundation. Couldn’t find a free parking space anywhere, but found a city lot near the place we were to check in. Six hours cost $16.00. Oh, well, stick it to the tourists. We got our tickets and walked the couple of blocks to Slip Number One, walking past the world’s largest banyan tree. It was eighteen feet tall when it was planted in 1878, and now it covers a complete city block. A most unusual tree. About 1:45 we boarded the Island Princess, the PWF’s whale watching boat, and after a brief introduction, headed out to sea. We have taken PWF cruises before, and they are fun and educational. Every PWF person on a PWF cruise is a marine biologist or conservationist, and is extremely knowledgeable and helpful. With conservation in mind, the boat ran on used cooking oil which is collected from the restaurants around the islands. Very green. We had not gone offshore more than a half mile when we ran upon a school (pod?) of spinner dolphin. Cute little critters, they are smaller than our gulf dolphins, but when they come out of the water they do a complete pirouette in the air…sometime two or three complete spins. Hence the moniker, spinner dolphins. After a few minutes of oohs and aahs, we set off for much bigger game. Didn’t take long, either, for us to spot splashes and big flippers in front of us. Apparently we were supposed to stay 100 yards away from whales, but the whales didn’t know that, and for the next hour or so, we had several head toward us. We had three official “breachings” when the whale roars completely out of the water and makes a tremendous splash. There is no warning when this happens, so I do not have it on video, but it is awesome to see. However, the whales also seemed to enjoy lollygagging around the surface of the water, laying on one side and flapping their large flippers against the water, and slapping their tails. According the our guides, it’s all part of the…um, dating process for male whales. The guides told us that Hawaii has approximately 10,000 whales visit each winter, all traveling thousands of miles to get to these relatively warm, safe waters to both breed and give birth. Interestingly, they have incentive to leav e in the spring…there is no food for whales in Hawaiian waters, so they don’t eat the entire time they are there. They come for one purpose, and when it’s done, they leave. Beyond the excitement of the whale watching, the cruise was incredibly beautiful. The waters around Maui are relatively protected and clean, a deep dark blue and transparent down to a depth of several feet. Dolphins and critters can be seen far below the surface, and anywhere you look, it invites you to jump in with snorkeling gear and look around. Things seemed to quieten after a couple of hours, so we headed back to the barn, and disembarked the vessel (naval lingo.) As I mentioned earlier, darkness comes early in this part of the world, and we arrived at our home about dusk. The trade winds from the northwest had risen dramatically, and the surf was really crashing just below our condo, and there was a slight chill in the air. We decided to stay in and not go out for supper, so in honor of our location and since we had bought some at the store…we had Spam sandwiches for supper. Spicy Spam with cheese…cuisine extraordinaire. Saturday, December 17 This morning the temperature was a shade cooler and the winds were really kicking up the surf. After breakfast (cereal, again) I walked down to the snorkeling ladder and the water was a churning, sandy soup. I decided that snorkeling at least in this spot was out of the question for a while. We sat around on the lanai, drinking coffee, surfing (the internet), and planning our strategy for the rest of the day. I wanted to drive up to Kapalua Bay to check out the snorkeling there. I was hoping the conditions would be better because the bay is protected by a barrier reef that should stop the offshore waves from pounding the beach. So shortly after lunch (sandwiches) we loaded up and drove to Kapalua. The day was beautiful, bright, and sunny, but the winds were still persisting. However, the cove was much better that Kuleana, so I donned my Snorkel Bob gear and dove it. Unusually hefty waves were still pushing the water to the shoreline, making it a chore to paddle out to the deeper areas where the fish and coral was, but it was oh, so beautiful. The coral fish were on display and the coral itself looked healthy and beautiful. I had an underwater camera (a low dollar cheapie 35mm), so I tried to take a few photos. My underwater shots in the past have never been very good, probably because I don’t have a good camera, but even with a low quality photo, the memories are still there. So we’ll see how the photos turn out. I paddled, photoed, and grew wearier by the minute, to the point that in 45 minutes my strength was about gone, and I felt I was being pulled out to sea by the undercurrent. I headed to shore and stumbled up the sand to where Shirley sat reading (water too cold!) and collapsed on a beach towel. I rested until I could get my breath again and decided that I had worked enough for today. Tomorrow maybe the winds will die down. We drove back to the condo, cleaned up a bit and started mulling supper. Lots of options around, but we decided to go back to the Sea House Restaurant, just across from our old Gardens at West Maui condo, where we have enjoyed a few very nice dinners in the past. We arrived about 5:30, and the host asked if we had been there before. I told him it had been nine years since we visited, and this time we were there because it was our 50th wedding anniv ersary. He said he would get us the best seat in the house, and he did…out on the outside deck at the very point overlooking the beach with a clear view of the setting sun. I took a couple of sunset shots to remember the moment. The crash of the waves, the sound of the Brothers Cazimero (Hawaiian musical giants) singing Hawaiian Christmas songs, the sea breezes, the lit torches, the incredibly fresh fish and fixin’s, the darkening sky and awakening stars…. (sigh) it was a nice evening. After we finished our main courses and were just enjoying the ambience, the waitress brought us a complimentary dessert of cake with “Happy Anniversary” emblazoned on it. A very nice gesture, I thought. As we were leaving, suddenly a light sprinkling of rain commenced, chilling us as we made our way to the car. But no matter, we enjoyed the evening. At the condo, I sat out on the lanai listening to the still-crashing surf and thought of the Brothers Cazimero song “The Sounds of the Sea Surround Me.” The Brothers Cazimero have been singing in Hawaii for 20 years and have become ambassadors of Hawaiian culture, but they have never been successful in the mainland United States. The reasons, of course, are their songs are too beautifully melodious, their singing is much too harmonious, and their lyrics are much too melancholy to ever appeal to a mainland market that puts high value on gimmickry and visual pyrotechnics. The U.S. consumer prefers sizzle; the Brothers Cazimero provide steak. But I digress. Sunday, December 18 Up this morning to prepare for church. We had called Brother Bailey yesterday, and we learned he would be preaching in the Kahului church this morning and not in Lahaina. The Bowdens had mentioned to us that the Baileys had two churches, one on each side of the island, and with the Lahaina church being close to us, we had decided to visit there. However, this being the Sunday before Christmas, their schedule called for one big service this morning and a Christmas program and dinner this evening, both in Kahului because it was a bigger facility. So we drove the 30 miles to Kahului. It was a beautiful Sunday morning as we drove along the West Maui coast. For the first time since we’ve been on the island, we could see the summit of Haleakala Crater, usually encased in heavy cloud cover. I had considered driving to the top of the 10,000 foot peak, but I had decided there was no good reason to go if you couldn’t see anything once you got there. Along the coastline, though, the wind had continued its blustery ways from yesterday, and there were whitecaps on the whitecaps on the high seas, and the surf was crashing onto the beaches. This, however, is ideal conditions for the hottest new sport in the islands…stand up surfing. It goes like this: instead of lying prone on a surfboard and hand paddling out to the breakers, the with-it surfer nowadays carries a long paddle and stands up while paddling seaward. Upon catching a wave, apparently one hangs on to the paddle for dear life while streaking for the shore. Truth be told, the professional surfers probably smirk at this lazy man’s way of reaching the breakers, but for the week end surfer, it’s probably less physically straining. I’ll never know. The music was furnished by a drum, keyboard, and a bass, and the instrumentalists were quite skilled. The singers were harmonious, and the whole order of presentation was on the same style and order of our Bethel Tabernacle singers back home. However, on a couple of the songs the rhythms had a definite island influence to them, which were upbeat and enjoyable. The sound system was very contemporary…Brother Bailey is apparently electronically pretty astute; he preaches from an iPad using a very good quality wireless throat microphone. The people responded to the music in a wonderful way with lots of praise and prayer. It was obvious they were using the music to communicate with their Creator. Having said all that, I will show my advanced, closed-minded ways again and say that the style didn’t really appeal to me…but I say that about most church music I hear of late. It is a spiritual defect of mine about which I am praying for healing. But I am ready to defend the proposition in a court of law that there is deep spiritual power in the old songs while there is simply shallow emotion in most contemporary music, and the difference is starkly apparent. (I just slapped my hand…I was starting to digress again. Now back to the events.) After 40 minutes or so, Brother Bailey began to preach, and his sermon was powerful and very high quality. The Baileys have been in the islands since 1997, and have carved out two churches which are solid and growing. We who have grown up in the Bible Belt do not understand areas where Christianity is in the minority and where God-led people have to begin their preaching with the most basic of sermons to introduce salvation to an unaware populace. The Hawaiians are steeped in their own religion and traditions, and I saw more than one tattoo (a major part of island culture) on several worshippers, both male and female. But these island people with their open hearts and kind spirits, having been brought to a new knowledge of the truth of salvation, respond to the worship of God and the preaching of His Word in a way that may put some of us old “professionals” to shame. After the sermon, Brother Bailey invited all to come to the front and pray, and en masse all moved forward. Those who were new to the experience quickly had prayer supporters around them, and the praying and worshipping went on for nearly 45 minutes. I must confess, I prayed a little, but I spent most of my time watching, perhaps admiring, how these people prayed for one another and seemed to have a genuine appreciation and love one for another. We were able to visit with the Baileys for a short while, but he had a church full of people to relate to, and I noticed that he made a point to chat briefly with every person in the room…and I would estimate the attendance at around 125-150. He did not ignore us…he was just taking care of his sheep, and I have a deep respect for that kind of calling. Around 12:30 we drove away from the school…er, church and decided to try to find a nice, generic (i.e. not expensive) restaurant for lunch. We drove up and down several main roads and never saw a restaurant. Lots of MacDonald’s and other fast food outlets, but no free standing decent restaurants. There were several big shopping centers which probably had restaurants, but I did not want to get embedded in a mall. Finally, we drove the 21 miles back to Lahaina, and found the Five Palms, a nice seaside restaurant for lunch. Sitting in an open air area overlooking the surf on a beautiful sunny day is a nice way to enjoy lunch even if one does sort of pay for the view. It was nearly 3:00 by the time we got back to the condo. The weather was actually a little cool, and the surf was still pounding, so I cancelled snorkeling until tomorrow. We rested for a couple of hours, checking emails, Facebook, news, etc. I may have (cough) dozed off for a minute or two. But I was up at 5:45 in time to photo the beautiful sunset over the island of Lanai. Maika’i loa! Spent the evening with a little writing and just sitting in the darkness of the lanai listening to the surf. Restful, actually. There was still a slight nip in the air, and an occasional mist of rain would breeze through the area to the point that I was forced to put a beach towel over my legs to deter the chill. But no matter, it was lovely. Monday, December 19 We decided this morning to have breakfast at the Sands of Kahana Resort, primarily because there was a sign out front advertising “Breakfast $5.99.” A breakfast for that price is as rare as a hen’s tooth in Lahaina, so we wanted to check it out. We have eaten at the Sands in times past because Consolidated Resorts, the consortium which owned our condo at the Gardens of West Maui also owned the Sands of Kahana. As a result, we, as members of the Consolidated “family,” could get a little discount, on their goods and services. Consolidated Resorts has long since gone bankrupt, so I don’t know who owns what now. Regardless, we sat down awaiting our bargain breakfast, and sure enough, the fine print said “between 7:30 and 8:30 a.m. only” We sat down at 10:00 a.m…we haven’t gotten up before 8:00 a.m. since we landed on the islands. Well, anyway, we had breakfast, but suffice it to say the price wasn’t $5.99. I mean, the coffee cost $3.00 per cup. At least the breakfast was good, and we left, full but wiser, knowing in the future to always read the fine print. What with our time on the island getting a little short, we decided to drive back to Lahaina and wander Front Street. Shirley had been wanting to do a little shopping, so we stumbled upon a free parking space (another rare item) and hit the street. When you walk Front Street, you don’t feel like you’re being hustled quite as much as when you wander down Kalakaua Avenue or the Waikiki Town Ce nter in Honolulu. Mauians are much more laid back and friendly. They’ll take your money, but they try to make you happy to give it to them. We went into a lot of sidewalk stores and never saw a junky one…even the ones selling Japanese coffee cups and Vietnamese tee shirts (“designed in Hawaii”) were clean and the sales help was courteous. I resisted the impulses but did buy one Hawaiian shirt (made in Hawaii), since the two I have left from our previous trips are now approaching 10 years old. Still good, though. I mean, that’s young…I have a pair of Florsheim dress shoes I bought in 1982 that still look nice. After wandering for an hour and a half and eating $10.00 worth of ice cream (3 scoops), we finally slipped back to our little home for a couple hours of down time. I haven’t been able to snorkel as much as I would have like on this trip due to the rough waters and breezy weather, but today was a little warmer even if the winds had not died down very much. Snorkeling at our condo was out of the question, however, because the rough surf was still churning up the sand and making water visibility zero. So we packed up and headed to Kapalua Bay, the primo snorkeling spot in these parts. By now, Shirley and I are pretty familiar with Kapalua Beach; we have spent many hours there during four of our Hawaiian trips. It is a friendly place for the novice or advanced swimmer…relatively gentle beaches, normally quiet breakers, and easy access snorkeling. Today was not an award winning day, however; the wind was still briskly blowing with a slight chill, and the waves, though not crashing in, would push you off your feet if caught unawares. Shirley, though she had prepared to swim, felt the chill and promptly sat down on a beach chair, put on her jacket, covered herself with two beach towels, open a book and said, “You go swim, and I’ll stay here and read.” I said, “But, Honey, you said you…,” and the look she gave me made chills run up and down my spine, and for a moment I felt great fear. Okay, I’m starting to exaggerate a little bit, but her swimming day was over. Actually the chill was much less when you were in the water. The water temperature was 79 degrees and quite comfortable. The air temperature, however, was also 79 degrees, and when the wind hit you it was a little chilling. The hardest part was just getting in and getting the snorkeling hardware on. Every time you tried to put on a flipper a wave would knock you off balance. I probably looked like a drunk guy trying to snorkel as I stumbled around getting fins, goggles, and breathing tube arranged. Finally I pushed off and headed to deeper waters and to instant serenity. The clarity was not the normal Hawaii perfect, but it was still pretty nice. The coral waving in the currents, the fish resplendent in every color of the rainbow, and the tiny spiny little shell dudes clinging to the faces of every rock made for moments to remember. Due to the winds and strong currents, I spent only an hour or so in the water before I was pretty tired out, but it was a most enjoyable time. I felt a little twinge of regret as we drove away from Kapalua Beach, not knowing when or if we would ever be returning. Well, Shirley had not gotten her shopping done, so after showering the sand out of my hair and tidying up a bit, we headed back to Hilo Hattie’s Lahaina store. Every man will testify that time stands still when waiting for a wife to shop, but I have also learned it is fruitless to rush the process. Patience begats peace…so I waited. She wandered every aisle three times but eventually said she was ready to go, so with a flash of cash, we left the building. It was time for our last traditional stop in Lahaina, MacGillicuddy’s Grill. I know it’s a chain restaurant, but we have eaten there several times, even with our daughter, Kimberly when she came to Maui, so we wanted to make a stop there. Besides, they have good hamburgers. Which is what I should have ordered. I ordered a ribeye steak instead, and it would not have made the cut in Texas. Not bad enough to send back, but just not a good one. As they say in the restaurant trade, though, the “ambience” was good, and it made for a pleasant evening. To the condo about 7:30. The next dreaded task…packing. This unfortunate activity began an hour or so later with some rudimentary packing into the suitcases. You know, extra clothes, papers, souvenirs, odds and ends that you know you will not be needing in the next 48 hours while in transit. All in all, Shirley and I travel fairly lightly, although she carries twice as much stuff as I do. We don’t hold a candle, however, to my beloved daughter-in-law, who for her family of four for a week at DisneyWorld (where they are now) used one single suitcase. With the price of checked baggage getting more prohibitive, perhaps we may ask her to give us some pointers. We will have spent $150.00 on checked baggage, and that’s just for two people. Not to mention little irritating expenses like $6.95 to use the WiFi at the airport terminals. Also, not to mention about $40.00 in tips we’ve paid drivers, porters, and whoever to load and unload those things. I hope I don’t sound too skinflinty because the enjoyment of this trip has made these little bumps in the road exceeding minor in concern. At 10:0 0 p.m., we were probably 75% packed. We had to vacate the premises Tuesday morning at 11:00, so we were ahead of schedule and were glad we wouldn't have to rush the next morning. We planned to have a leisurely breakfast before we said our final goodbye. For the last time (sniff) we sat on the lanai listening to the surf (still) crashing in, feeling the light mist of rain spray us, and shivering from the chilly breeze. Actually, we went inside in just a very few minutes. Tuesday, December 20 At 10:45 a.m. we said our sayonaras and drove away from Kuleana Resort. As befitting the event, it was drizzling rain, and it continued as we traveled south and east through Lahaina, Ma’alaea Harbor, and toward Kahului. We decided to stop at the Maui Tropical Plantation, an outdoor museum of native Hawaiian flora and fauna. We had visited nine years ago, so it was another homecoming. Shirley has an affinity for flowers, especially hibiscuses, and Hawaii has some of the most beautiful…even blue ones . We did not take the garden tour this time, so we didn’t get to see the lady crack open the cocoanut with her bare hands, as I had mentioned earlier. Leaving the plantation, we continued to Kahului, stopping at various spots of national interest (Walmart and Kmart). Shirley was trying to find some yarn for one of her knitting projects. Weird thing about Walmart…there were no plastic bags at the checkouts. We saw some folks with cloth bags like some of the grocery stores encourage using, and some just carried their items out in their baskets. The clerk was so busy and somewhat businesslike that I didn’t take time to ask her if that was store policy or they had just run out of bags. Driving east from Kahului, we passed the hippie town of Pa’ia, known for its laid back youth culture. The word is out, though, and it’s becoming Lahaina east, with trendy shops and artists infiltrating the main street. It hasn’t affected the main sport of the town, though, which is wind surfing. The trade winds are persistent year round on the beaches around Pa’ia, most notably Ho’okipa Park, creating tremendous waves and attracting wind surfers from around the world. It is incredible to watch them as they catch a wave and become 10 to 15 feet airborne at amazingly fast speeds. One needs to be a powerful swimmer just to handle the powerful, pounding surf, much less handle a sail on a surfboard at the same time. Very graceful in action, though. Back to town to stop at one of my favorite places…good old Denny’s. Breakfast was pricier than in Houston, but compared to Lahaina, it was a bargain. We sat for awhile, sort of catching our breaths, and finally headed to Advantage Car Rentals, where we dropped off our Subaru Impreza and caught a shuttle to the airport. The Subaru was not a particularly impressive car. As we waited at Gate One for our 11:30 flight to Phoenix, it was 8:30 and there was not a single soul at Gate 1 or 2. U. S. Airways had two flights out that night, both to Phoenix. The first flight left an hour and a half before ours, and the flight attendant said there would be 45 people on board. We asked if we could leave on that flight…yes, we can, she said…for $100.00. If I had known we could take an earlier flight out of Phoenix to Houston, I would have taken it, but she couldn’t guarantee that, so I decided we may as well wait in Kahului as Phoenix. It’s a lot quieter in the Kahului terminal. Around 11:00 p.m. Hawaii time we finally boarded our plane, and there were maybe 45 passengers on board. That always makes me happy because I figure with the less weight, we’ll get off the ground easier. And we did; with a roar and a strong push we left paradise about 11:30, heading east into the darkness. The lights went dim, and everyone made an attempt to get as comfortable as possible for the five and a half hour flight to Phoenix. Thank goodness for iPods, MP3s, and good earphones. I had downloaded a couple of magazines on my Kindle Fire and read for a while, but eventually the weariness of the day set in and I plugged into music and fitfully slept most of the way. We uneventfully arrived in Phoenix, and actually got there 30 minutes early thanks to a strong tailwind according to the pilot. What that meant for us was simply a longer wait for our flight to Houston. So we dawdled in the airport for nearly three hours. Our flight to Houston was another experience in sardine living, but at least it was uneventful. About 2:30 Houston time we walked out of the terminal to meet Janie, who graciously drove us to our comfy home. Shortly after 3:00 p.m. our Hawaii adventure came to an end. We were exhausted from having been up and awake for nearly 27 hours, but the enjoyment of the last ten days made it a pleasant weariness. We will ever be grateful to our wonderful family for making this trip possible for us. Shirley and I are the most blessed people on earth.